** Choose a Tucker Belt if buying a matched holster and magazine pouch, especially if you want decorative stamping. Time to ship is a week to 10 days. 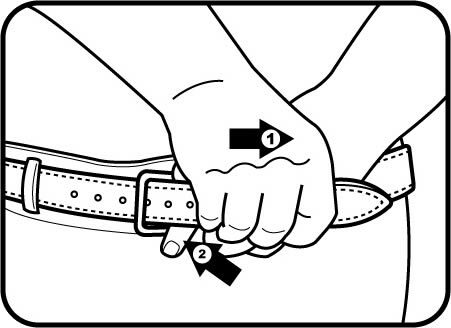 You need a true gun belt - a belt with two layers of leather bonded and sewn together so it resists twisting.This spreads the weight of your gun out over a larger area and prevents sagging, pulling and droop. When you draw your gun, the holster and belt should not pull up with the gun, but stay stationary. A true gun belt like ours will make you feel like the holster and gun are part of you, not some bothersome appendage flopping around on your waist. The gun belt is the foundation of comfortable carry. Latigo Canyon Gun Belts ship in 10 days or less. They all come with 7 holes 3/4" apart and with a square buckle. These belts are an excellent choice for wear with your favorite belt or IWB holster. The belts are 1/4" thick. 1-3/4" Width is usually not as popular as 1-1/2" width for your jeans or Dockers, but some customers prefer this width. The best way to put on a stiff gun belt is to avoid bending the tail of the belt back to the right and pulling. Instead, put the tail through the buckle, grab it with your right hand and move hands in opposite directions until you reach the hole you want. Same goes for taking the belt off. Second belt I have bought from Tucker and they are both Great! Highly recommend them if you wish to carry a weapon in comfort and have it look nice too. I had a few questions about color options before ordering this belt. I had a response within the same day and placed my order. My belt shipped within a week of ordering. Extremely satisfied with the quality; an excellent belt. The fit is perfect.